This very much applies to the many especially young executives who look for lucrative and better job opportunities. But careful planning and following a financial checklist before one change a job can give them all the benefits of the change and more.For the smooth transition from one job to the other you need to carefully attend to the points discussed in the below checklist. Opening of a new salary account and the non-maintenance of the old accounts should be carefully considered. Most companies would require one to open a new salary account in the bank advised by them. This would leave one with an extra account to be maintained. The old account, which you have opened when you were in your earlier company, would after 3 months lose the benefit of zero balance of a salary account. It would also seem unmanageable since regular operation of the account and maintenance of minimum balance may be difficult. Lack of regular maintenance and minimum balance could also invite penalty charges. In case of a non-operation for over 2 years the account could become dormant or inoperative, inviting additional yearly charges as a penalty and extra charges if average quarterly balance goes below the minimum amount that is set by the bank. If your old salary account is linked to various investments (like Mutual funds, shares…) and loans, you may want to update the new salary account with the respective investment company and financial institutions. A careful consideration has to be made regarding how to deal with Employees Provident Fund Corpus. Switching jobs suggests 2 ways of dealing with Employees Provident Fund Corpus. You could either transfer your existing account to the new employer or close the old account and open a new account. However withdrawing the corpus and opening a new account could be time consuming taking between 3-6 months. In addition, you would be left with a smaller retirement corpus because you would lose on the advantages of the corpus compounding. You would also have to Tax planning if it is withdrawn before 5 years. So just transferring the corpus would give you better tax benefit and retirement benefit. This task is best left to the human resources department of both the old and new employers. You need to check up the features and benefits of the health insurance provided by your new employer. You need to compare these with the health insurance provided by your previous employer. Especially you need to look into the features like the Coverage Amount, whether the coverage is on floating basis or individual basis, the total number of dependents covered, the list of hospitals for cash less facility. One more important point to check is the availability of the health cover during the notification period. Notification period is the period between one submits the resignation letter and one gets actually relieved from the job. Normally it is 3 months period. Some employers don’t provide health cover to employees who are in the notification period. So before entering into the notification period, one needs to make alternative arrangement before entering into the notification period. Tax liability and exemptions form an important consideration while switching jobs. Most employers would be computing employees’ tax liability after taking into consideration the basic exemption limit of Rs.2 lacs and also the exemption availed under Section 80C. So there is a possibility that your previous employer and present employer may give you these exemptions for the same financial year. 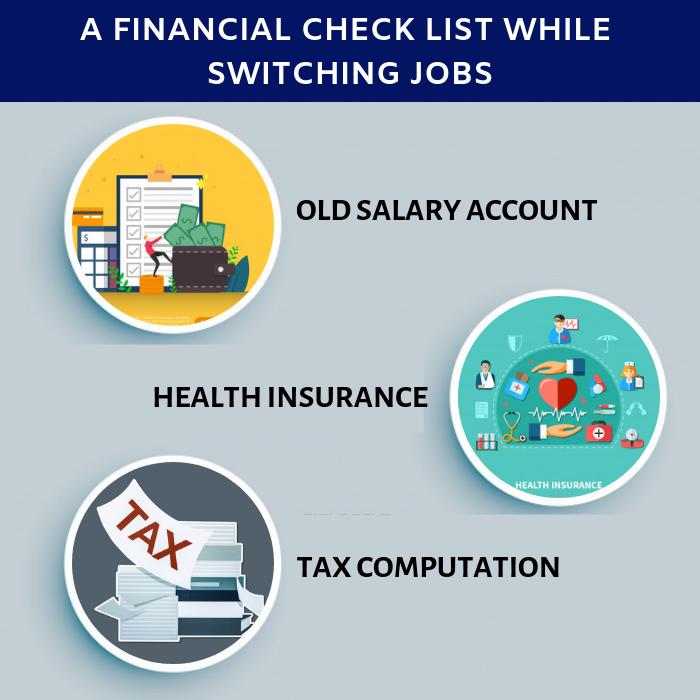 Making a job switch in the middle of the year involves making sure that the deductions and exemptions regarding tax liability are made only once. Always report the income earned from your previous employer for that financial year to your new employer. This would avoid duplication; thereby making sure one is not taxed twice or given twice the benefit and having to pay the lump sum taxes later. If you are not intimating your income from the previous employment to the current employer, then you may need to pay some penalty for non-payment of advance tax or TDS. It proves essential to collect the Form 16 from ones past employer as a proof that one has received the tax benefits and paid the tax liabilities. If you have worked for more than 5 years, then depends on the terms of your employment you will be eligible for gratuity, Superannuation , and other similar retirement benefits. Some schemes can be carried over to the next company and some other schemes need to be encashed when exiting a company. You need to pay attention to the details of these schemes before quitting your job. How very true it is, “Planning is bringing the future into the present so that you can do something about it now”. Hence following all the steps of the financial checklist while switching jobs would make sure your journey from one job to another is smooth and trouble-free.